For a food blogger, coming across cool, new restaurants is an easy task. The hard part is just choosing the best out of the bunch to blog about. Now for a halal food blogger its a little different, there simply isn’t a huge amount to choose and even less so if you are looking beyond the standard Middle Eastern or South Asian options! Following endless hours of scrolling, sleuthing, and tapping away at my iphone like a crazy person, every now and again I come across a restaurant that I feel will actually be fun to blog about. It just so happens that one such place caught my attention and also features what I understand is a favourite amongst my readers – fried chicken!! Sharp, tangy pickles that had been sliced in half, dunked in batter, and deep-fried. The batter wasn’t greasy at all, and managed to hold in place without becoming soggy. 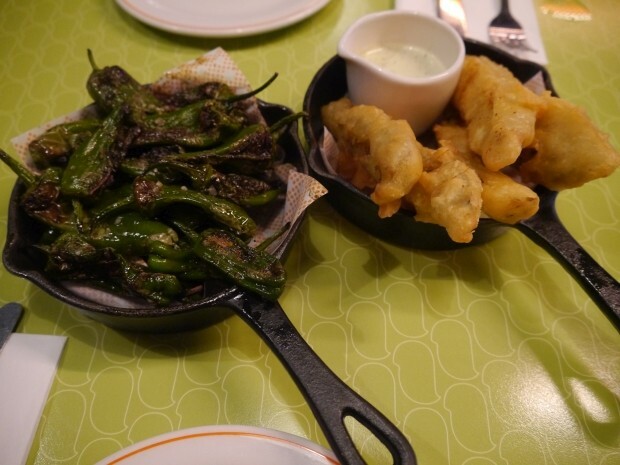 The padron peppers were peppers that had been blistered until slightly charred and wilted, and then sprinkled with a healthy amount of salt giving a nice, salty kick in every bite. A bowl of fries that were thin and crunchy, but nothing spectacular especially since they had used house seasoning (which I couldn’t taste). 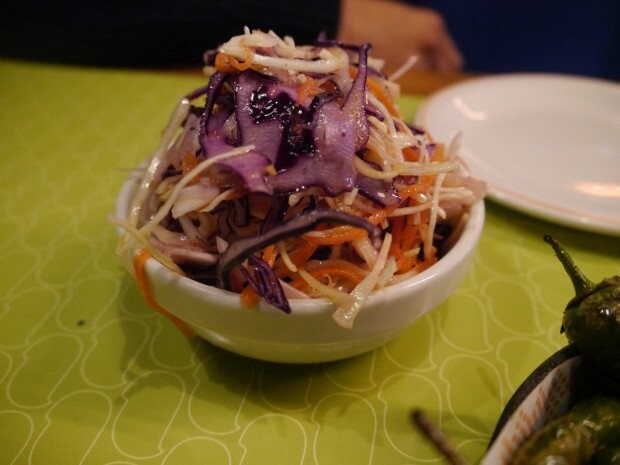 The slaw was not the usual mayo-laden coleslaw you’re use to but instead a dry combination of shredded cabbage and carrots with a touch of apple cider vinegar. As a side salad, it made a refreshing change to all the fried food we were about to encounter, but did not stand out from the other side dishes. BIRD offer a range of glazes and dips to complement your chicken wings so we opted for a portion of 12; half being buffalo and the other half Gochujang (as recommended by the waiter). The wings had been dipped in a gluten-free combination of flours, deep-fried to form a slightly crispy skin on each wing, and then tossed in the chosen glaze. 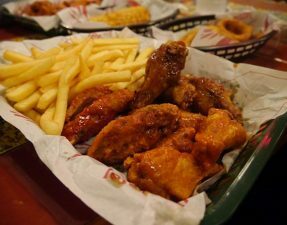 The buffalo wings had that familiar vinegary kick, however lacked the oomph in flavour as seen in other restaurants (Stickywings). 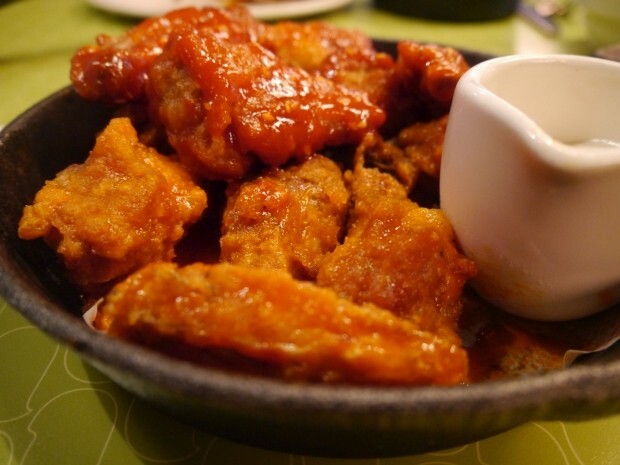 The Gochujang, a hot and sweet sauce, wings fared better and had a lovely, subtle sweet crunch. The chicken itself was hot, moist, and you could taste the good quality of the meat – this was not old-tasting nor claggy, but instead fresh and really delicious. We had originally opted for the Nashville Sliders however having been told that they had no slider buns (at 1pm on a Sunday), we opted for a Korean-style take on fried chicken. 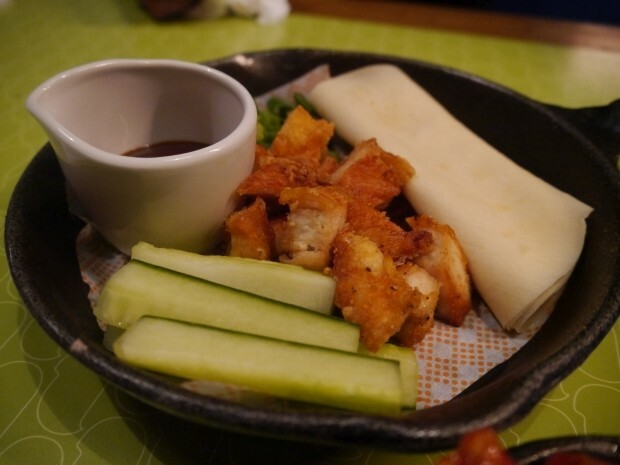 They had chopped up and fried small pieces of chicken thighs, and served it alongside pancakes, spring onions, and cucumbers. This dish was unfortunately our least favourite of the meal. The chicken was quite dry and given that this was an asian-inspired dish, could have done with some sort of suitable asian spices. The meat to pancake ratio was a little low so perhaps shredded chicken would have been better, plus they could have done with thinner cucumber slices. It wasn’t a disaster but I’m not in a hurry to order this again. 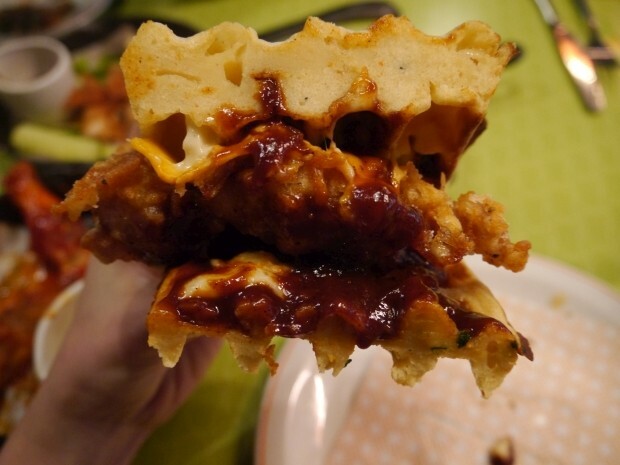 Two deep-fried, crunchy boneless chicken pieces smothered in melted american cheese, sweet maple syrup, hot sauce, and spring onions, and sandwiched between two pieces of cheddar and onion waffles. 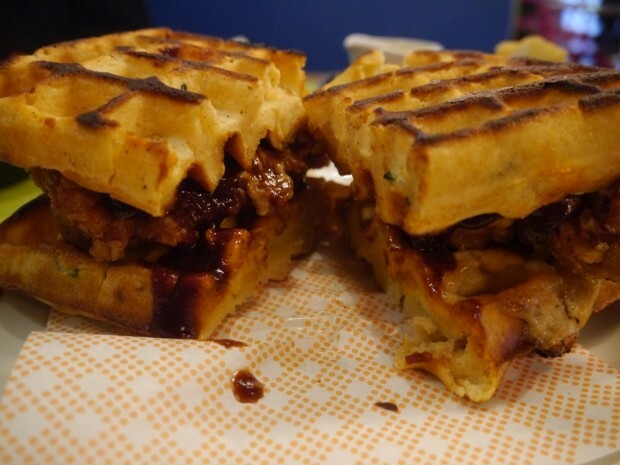 I’m not the biggest fan of cheese in waffles (see: Meat and Shake) but these waffles were not too stodgy, definitely not burnt, and cut through the sweetness of the other condiments. Perhaps they could have been thinner so that you didn’t get full up quickly but everything else was done really well. The chicken had a delicious crunch especially as they had used non-gluten flour which was a nice change, and the maple syrup mixed with the hot sauce almost gave a barbecue sauce flavour. 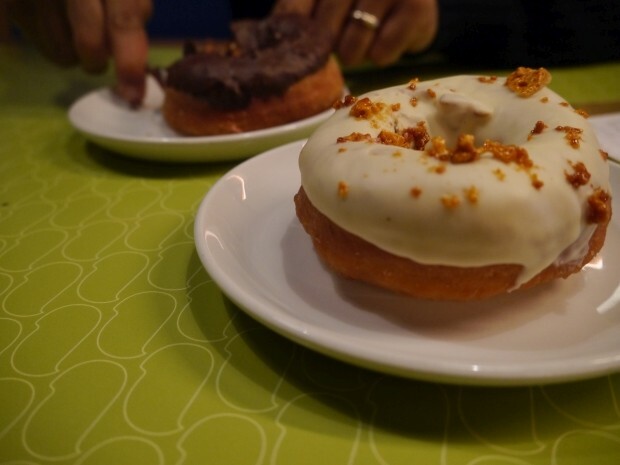 BIRD also operate a doughnut stand within their restaurant that serves up freshly baked doughnuts every day with a variety of constantly changing flavours. I haven’t had a doughnut in MONTHS so of course we decided on two: white chocolate with honeycomb pieces, and dark chocolate with hazelnut. The doughnuts, unfortunately, were not as fresh as they should have been, however, that said, the honeycomb and white chocolate doughnut tasted great with a good combination of the crunchy honeycomb pieces and the sweet chocolate icing – perfect with a hot cup of tea! The final bill amounted to £42, including drinks, service, and the removal of the bacon disaster, so around £14 each for the three of us. A little pricier than your below-average chicken shop (Sams, Chicken Cottage, PFC etc.) 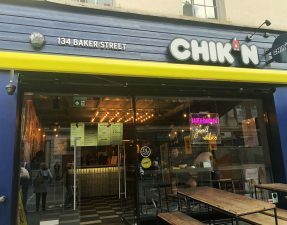 but considering this isnt your typical chicken shop, the quality of the chicken plus the amount we ordered, I found this to be a very reasonable price for lunch, or even dinner, with friends or family. 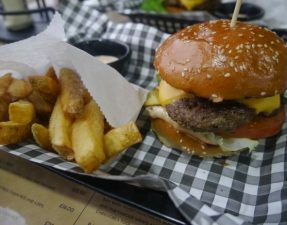 With regards to the incident with the waffle burger, I have to say that the staff were sincerely sorry about what had happened, and putting that aside, they were generally happy and helpful. We left the restaurant feeling almost satisfied but didn’t feel heavy or gross, which can be quite normal after eating fried food. The meal had its ups and downs, and yes, their wings can’t compete with Stickywings, but it is pretty rare to find something like BIRD in London – a relatively popular restaurant that serves both halal and free-range chicken, with an added bonus of not having a ludicrous price-tag attached! It’s rare to find halal certified chicken (as Bird stated on your instagram) and bacon under the same roof. Slightly off putting but I’d still visit if I’m in the area – everyone loves a bit of fried chicken right!? I agree – maybe worth checking out if in the area otherwise not worth a journey! I work right nearby and had no idea! Sounds like its worth the trip every now and then. 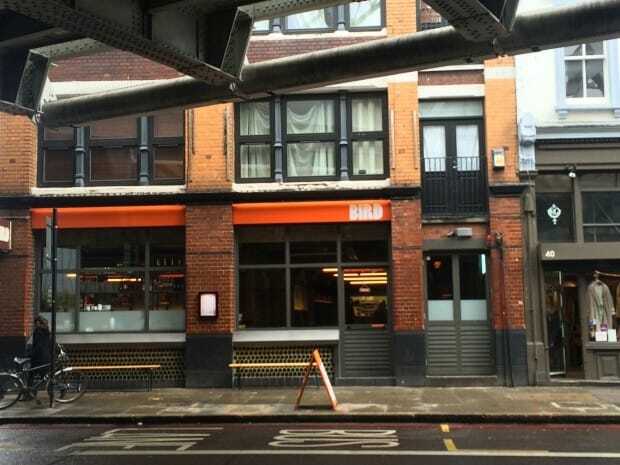 Is the Camden branch halal? I’m afraid they do not do halal from my conversation with them. It is best to ask when you are there. I have heard good things about their deep fried oreos!